Stocks ripped higher on Wednesday after Federal Reserve Chairman Jerome Powell said interest rates are close to neutral, a change in tone from remarks the central bank chief made nearly two months ago. 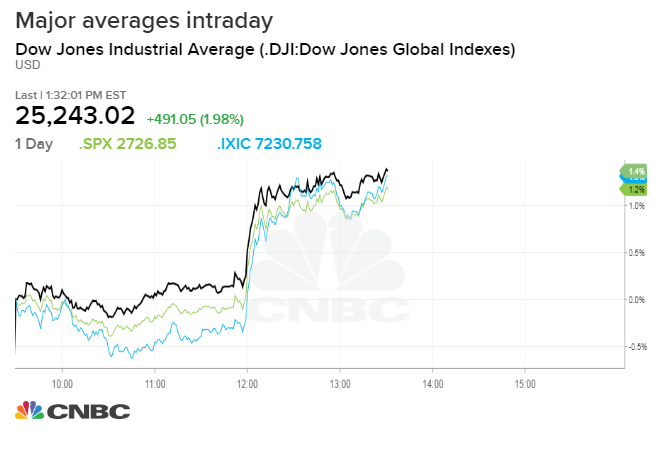 The Dow Jones Industrial Average climbed 600 points while the S&P 500 jumped 2.2 percent as traders took the comments to mean fewer rate hikes were coming in 2019 that could derail the bull market. The Nasdaq Composite advanced 2.9 percent. The Dow and S&P were now positive for November after Wednesday's comeback. "Interest rates are still low by historical standards, and they remain just below the broad range of estimates of the level that would be neutral for the economy — that is, neither speeding up nor slowing down growth," Powell said in a speech at the Economic Club of New York on Wednesday. Robert Pavlik, chief investment strategist at SlateStone Wealth, said Powell's comments were "exactly what the market was expecting to hear." He added: "Obviously it has to do with the market reaction to his previous comments. He had to walk that back." The "just below" language is different from the "long way from neutral" characterization he gave at the beginning of October, which helped send the S&P 500 into a correction. Bank stocks climbed as short-term borrowing rates fell and long-term rates rose following Powell's remarks. The SPDR S&P Bank ETF (KBE) rose 1.2 percent while Morgan Stanley, Goldman Sachs and Bank of America all traded more than 2 percent higher. Powell's comments were eagerly awaited by investors as they worried the central bank may be tightening monetary policy too quickly. The Fed is largely expected to raise rates by 25 basis points next month. The central bank has already hiked rates three times this year. Traders now see only one more hike fully prices in for 2019. The Fed's decisions on monetary policy have drawn criticism from the White House recently. President Donald Trump told the Washington Post that he wasn't "even a little bit happy" with his appointment of Powell as the Fed's Chair, adding that he thought the central bank's recent actions were "way off-base." Traders work during the Pivotal Software Inc. initial public offering (IPO) on the floor of the New York Stock Exchange (NYSE) in New York, U.S., on Friday, April 20, 2018. Tech shares rose broadly on Wednesday, recovering some of their recent steep losses. Amazon and Netflix gained more than 6 percent, while Apple and Alphabet rose more than 3.5 percent. Facebook climbed 1 percent. Easing worries on U.S.-China trade also boosted stocks on Wednesday. A New York Times report said Trump was worried about the impact of a long trade war with China on markets and the economy. This could lead Trump to seek a compromise with China on trade, the Times said, citing U.S. officials. The report comes after Trump told The Wall Street Journal on Monday it was "highly unlikely" that the States would delay from increasing tariff levels to 25 percent on $200 billion of Chinese goods, which put some markets under pressure. White House economic advisor Larry Kudlow appeared to alleviate concerns on Tuesday, however, stating that the Trump administration had resumed discussions "at all levels" with China's government. Trump and Chinese President Xi Jinping are scheduled to meet for dinner on Saturday at the G-20 summit in Argentina. The two leaders are expected to discuss trade, among other issues. "There will be noise going into year-end, but I think we'll end the year with a moderate message on the Fed and a moderate message on trade," said Tom Martin, senior portfolio manager at Globalt. "I think the market is expecting that."